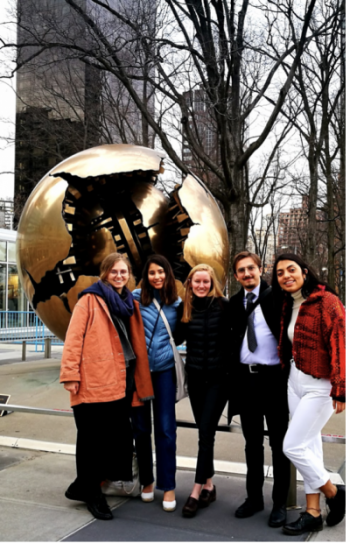 Watch the press conference of SJSF’s Declaration for Clean Energy at the UN Conference of the Parties in Cancun, Mexico! It was around 10 am on Thursday, December ninth, and the COA COP16 delegation was due to have its daily meeting. Students slowly arrived to the coffe shop at Cancunmesse where the meeting was to take place. As we waited for the rest of the team to join us some of us fell onto Morpheus’ arms, resting our heads against the table that is meant for the coffee shop’s diners to have their food. The scene was quite comical and the opportunity to take funny pictures of people uncomfortably trying to have a nap at the table was not missed. When our professor and delegation leader Doreen Stabinsky joined us, one of us arrived carrying a new bag from the Korean booth, which has become quite popular for those. Doreen then asked where to get the bags, so one of my fellow COA delegates directed us to the right place. We got one of the colorful Korean bags for each of us. They are super eco friendly -apparently- because they are made of recycled banner material. It took me a little longer than everybody else to go back to our meeting spot from the Korean booth because I was reading one of their hand outs, so when I got there everyone was gone except one -they had left my bag unattended which was not cool but that is OK-. 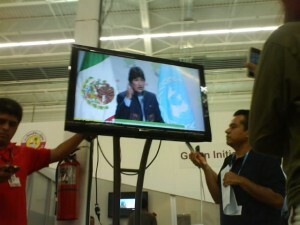 We then went on a search for a television set where we could follow the speech by President Evo Morales. When we got to the patio area where there is a big television on a stage we found nobody and the screen was showing the obnoxious video that the Mexican government had been using to promote tourism in Mexico on every single screen I had seen at the conference since I arrived, with the cheesy slow motion sequences of beautiful women, the happy playing children and all those things that shout “we are such a happy people, come to our country and spend thousands of dollars!”. So then we got back into one of the halls and found a TV that was showing live footage of the plenary room where Evo would give his speech. Expectation started growing fast. We figured it would be a while until the Bolivian ideologic -and some would say, spiritual- leader appeared, so we sat at one of the couches close to the TV. A couple of minutes into our daily meeting and the time had come. Buckle up, your minds are to be blown up. We gathered around the screen but could not hear anything, we could only see the images. I thought the volume was not the problem, but that there was no audio signal coming into the TV. Juan proved me wrong: he put the volume all the way up and then we could clearly hear what was going on. We first saw Patricia Espinosa, president of the COP16, give a starting sentence and then introduce Evo Morales. Finally we saw him there, his solemn face, his calm manners, his characteristic jacket. He thanked the different members present at the meeting, in a rather awkward, too-quick way, like he does not like having to be all formal for this kind of events. He started very slowly and trippingly, like he was either looking for the best words to express what he wanted to say, or he was not that sure of what he was saying. He looked nervous. As he started gaining momentum and finishing his sentences in semi-normal lengths on time, I realized the amount of pronunciation and even grammar ‘mistakes’ he was making. I took that as a proof that his mother tongue is not Spanish, but some indigenous language from Bolivia. Spanish is for him just a borrowed tongue he has to use to express to the world the desires and demands of those who have been forgotten at most levels: the indigenous, whose ways and cultures were never really vanished by the European penetration of the Americas, nor fully assimilated by the ‘new’ culture. Most of the speech felt like the ‘generic’ Evo Morales speech but it was nevertheless worth watching. The passion he was putting in his words was made visible by his using a cloth to wipe the sweat trickling down his forehead. I looked around me and about 25 people had gathered to watch the screen. I could see some ‘gringos’ who did not seem to understand fully what was being said, but who still stood there, feeling the energy blasting out of the TV speakers. There were two men that took out their audio recorders and did not miss the chance to record the speech putting their devices next to the speakers. People then started taking pictures even though it was not even ‘the real thing’- we were watching it on TV. Then, the key line of that speech appeared: “Si nosotros mandamos a la basura el Protocol de Kyoto, seriamos responsables de econocidio, ecocidio, y genocidio” (If we toss the Kyoto Protocol in the garbage, we would be responsible for econocide, ecocide, and genocide). The continuity of the speech was then interrupted by a round of powerful applauses that went on for almost a minute. Those words of wisdom captured a very uncomfortable truth of the state of the world: nowadays ‘not knowing’ cannot be an excused for inaction since we are constantly being bombarded with information from all fronts, including information about climate change and climate justice. We know what climate change is about, we know what we would have to do to stop it, we know that if we do not do so many preventable deaths will occur. Genocide can be passive: it does not have to be the privileged one shooting at the less-privileged ones, it can also be the privileged ones not helping the less-privileged even when they can, even when what ails the less-privileged is their fault. No matter how faulty in terms of grammar and pronunciation, or confusing at times due to its slowness this first speech of Evo Morales at this COP was, we cannot deny the power and the honesty of his words. Action Alert: Tell Canada and Japan to Lead, Follow, or Get Out of the Way! Request from our friends from the Canadian Youth Delegation. BREAKING: Canada was poised to be a major obstacle to negotiations by standing against the Kyoto Protocol process–but your pressure is paying off! The Canadian delegation appears to be holding its fire on Kyoto for the time being. There is a real sense that if we can move Japan off its obstructive position on the Kyoto Protocol that Canada will follow suit. We’re asking you to do two things: call the Prime Minister’s Office and call the Japanese Embassy in Ottawa. Call NOW to tell Canada to stop supporting Japan’s obstruction! While current commitments under Kyoto are nowhere near an adequate response to climate change, it is currently the only legal framework we have for a global deal. If developed nations like Canada and Japan block the Kyoto Protocol process, developing nations may walk away from the negotiations. If Kyoto continues, there is no reason that developing nations and the USA cannot also take on commitments. But without Kyoto, the entire negotiating process may be derailed: we’ll lose over ten years of hard work and will have no framework to create a legally binding deal. We’re fast approaching the time that science says we need to peak our emissions—we simply don’t have time to start from scratch. Canada says that developing nations will not walk away from the talks because they have too much to lose—essentially saying that developed nations can hold support, such as technology transfer and adaptation financing, hostage while eroding the entire negotiating process. Yesterday, Environment Minister John Baird dismissed the central principle of developed nations’ historical responsibility for causing climate change as a “sidecar” issue. Canada is refusing to take responsibility for its contribution to climate change. Throughout the negotiations, Japan has threatened to block the Kyoto process. We know that Japan, with Canada standing behind it, is one of the biggest obstacles to progress in these final hours. The Japanese Government is feeling the international heat, but we need to turn it up. We need Japan to know the world is watching, and we need our government to know that by standing behind Japan they are acting directly against the desires of Canadians! Here’s a video that Graham and I participated in at Klimaforum on Young and Future Generations Day.